X-Small (3) - $40.99 Small (4-6) - $40.99 Medium (7-10) - $40.99 Only 4 left! Large (10-12) - $40.99 X-Large (14-16) - $40.99 Only 3 left! Finally, you’ve found a bat that you’ll be glad to have inside the house! She'll be the cutest bat on the block when she wears this cozy bat costume for girls. Take her out on the trick-or-treating rounds in your neighborhood or let her be the star at her little costume party. The whole world will be excited to see her smiling bat face! Bats may have a bad reputation – after all, they are a little creepy. We mean, flying around only at night, living in your attic, and having teeth that too closely resemble a vampire’s – it makes them kind of scary for most people. Whether you’ve had your own terrifying encounter with a bat or you just hope to never run into them in person, we think this adorable bat costume for girls will change your mind when it comes to being afraid of getting too up close and personal with one of the nocturnal creatures. 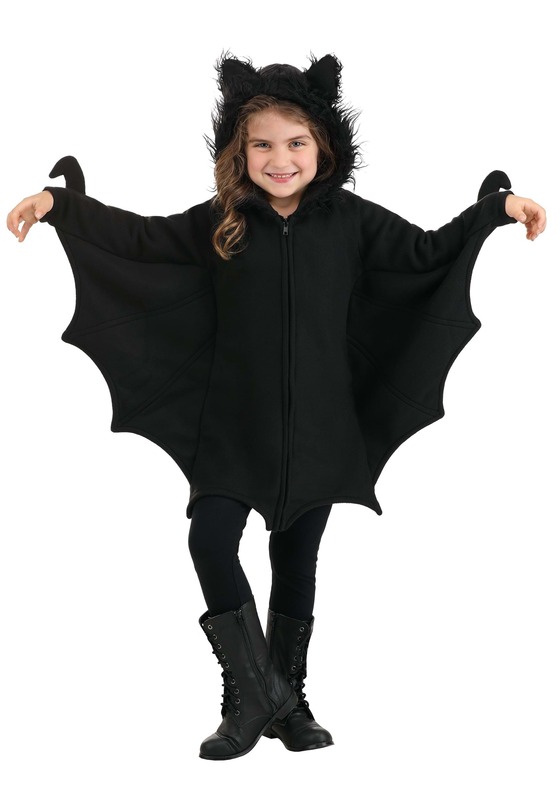 This bat costume for kids has a soft, fleece body and plush faux fur that will make you want to snuggle her tight – not like the real thing that you’d rather chase out of your house with a tennis racket. The front has a zipper closure for easy on and off and the bat-wing flaps are sewn between the sleeves and side seams for a fun and easy look – not to mention you won’t misplace the wings! The bat hood completes the look with fur-tipped ears. No one will yell ‘duck’ when this bat flies through your neighborhood this Halloween!